I finished the top. I collected the fabric for this quilt for 7 months, so it is so much fun to finally see it come together and see all the colors mesh. Its very colorful, but I wanted something bright to compliment his neutral furniture. And, there’s very little white in it, since it will be on a little boys bed. I used this pattern again, which I love. It ended up being a perfect X-Long Twin about 64″ by 94″ with some room for shrinkage. Now the question is how should I quilt this? I was going to quilt in the ditch, and then maybe 1/4″ around each square, which would take forever, but now I’m thinking I should just stipple the whole thing? Since its going to get A LOT of wear and tear on my son’s bed, do you think stippling would make it more durable? I have some time to think about it I guess, but I would love any suggestions too!!! Happy Friday to you all! this is so great! I love the fabrics you used, I love american jane! i’m not at all sure about durability, that is a really good question. I love this quilt. I’m not sure about top quilting in terms of durability. I am working on quilts for my kiddos as well. I don’t care for stippling, but I’m sure I’ll have my top-quilter do something a bit tighter than usual. I like your idea of stitching in the ditch, personally. Any way you do it, it will be beautiful! Oh I LOVE it! There’s nothing I like more than a ton of different fabrics in one quilt – that still all work together! And I would stipple it. But I stipple EVERYTHING, so I’m kinda no help to you there… But it would look great stippled! It looks lovely! But I think a different quilting as in the ditch could give more durability and originality to it. 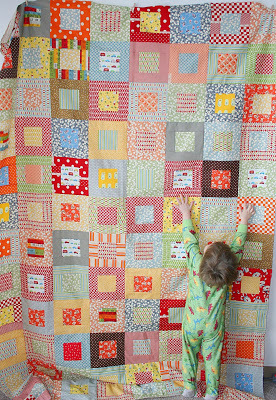 Have a look to the quilting way made to this bloggers: quiltit.blogspot.com and myauntjune.blospot.com . Easy and original! This is perfect for a little boy. I just love it! I’d probably stipple or do stripe quilting. I’m sure it will get lots of wear. What a GORGEOUS quilt! (I want it!!!) :) Your son is gonna be so snuggly under it! I don’t have recommendations regarding durability and quilting, but I am a stitch-in-the-ditch fan. I just like to highlight the actual quilt itself, and your work here is so good already! The colors are wonderful, too. wow! it looks so cheery! I LOVE it, it so a great mixture of all different fabrics. I have been wanting to do this lately too. I would quilt it in lines (length and width) so it makes squares. ohhh gorgeous!! I love stippled quilts so that gets my vote. This is such a happy quilt. I’ve copied the instructions for future reference. Love the picture of the STRETCH! I love the quilt and I would stipple it. Can’t wait to see it all done. This quilt is fantastic!!! Love it!!! I like the idea of stitch in the ditch but stippled quilts just look more comfy to me. Either way it’ll look great. I can’t wait to see it finished. LOVE it!!! Well done, it looks great!!! Im devastated that i just used the last of my american jane fabric that you used in the pic from WIP post. Its all gone from quilt shops too!! I just quilted a similar squared quilt, and i did a square 1/4 in the inner square then another 1/4 in from the next square. Looks great!! On a quilt like this i would even consider using some of that special top stitch fabric in red or something, it will end up looking like you hand quilted it all if you choose a wide stitch! Is Ben going to a BIG bed soon?? I just found you on flickr and I’m in love with so many of your creations. I’ve been wanting to do some little quilted bags, and your work inspired me to do a “quilt top” for a bag tonight. thanks. I can’t give advice on the quilting technique, but go with your gut! Really cute. Ben looks so big. I don’t think Andrew is that big yet. You’ve got a birthday coming soon…. Your quilt looks great! Congrats on being featured on Sew Mama Sew! Well deserved! What a beautiful quilt. How did you choose the fabrics? Did you have a theme in mind? 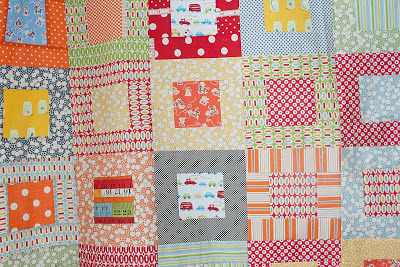 i love your beautiful blog, and this quilt! stunning.